about an hour south of Monterey, California, on Highway 101, he’d spent more of his life behind bars than outside them. He’d never seen a cell phone—in fact, he says that he was confused when he saw an iPhone with “music coming out”—and had never had a credit card. He’d barely driven a car. Now an imposing but soft-spoken 48-year-old man, Atkins was 17 when he was arrested for a shooting in his neighborhood back in 1985. He’d been involved in some illegal activities—mostly stealing car radios to support a drug habit—but he was innocent of the shooting. In fact, he had sold a stolen car stereo that very night in order to get high. Atkins was accused of robbing Vincente and Maria Gonzalez at gunpoint on New Year’s Eve and fatally shooting Vincente in the chest. Shortly after the murder, Maria said that the man who’d shot her husband and held a gun to the back of her head was short, with bulging eyes. At the time, Atkins was well over six feet tall and weighed 175 pounds. It was only later that Maria picked him out of a six-pack photo array. At the trial, she couldn’t identify Atkins, who was in the courtroom sitting at the defense table. “I know he is here because he behaved very badly,” she said when asked to point out her husband’s killer. During a break, she spoke with the prosecutor, after which she seemed to be able to identify the defendant. Exonerees like Atkins are being punished a second time for crimes they did not commit. Another woman in the neighborhood, Denise Powell, claimed to have heard Atkins and his friend Ricky Evans bragging about the crime. Picked up by the police, Powell claimed that Atkins had said, “We offed him”—a recollection that would later turn out to be fabricated. She then picked their photos out of a “gang book.” Atkins knew Powell and had seen her that night; she was usually high and was in and out of jail. They had gone out looking for drugs together. The car ride was the only part of her story that was true. Powell later said that she was threatened by the interrogating officer with arrest and jail time unless she could provide some useful information. She never thought that Atkins would get convicted based on her word alone. When asked about Powell, Atkins shrugs; he feels sorry for her because her life hasn’t changed much during his 23 years in prison. Atkins and Evans were arrested and held in the county jail, where some gang members who were also inmates forced them to fight. But the friends went too easy on each other, so the gang members decided to administer a beating themselves. A few of them jumped from a top bunk onto Evans, who died from the internal injuries sustained during the attack. It’s the one thing Atkins doesn’t like to talk about. “It’s difficult for me,” he says quietly. Atkins was beaten as well and spent months in the hospital recovering from a broken sternum and broken ribs. (He credits his survival to his larger size.) Upon his release from the hospital, he began serving his sentence: 32 years to life. 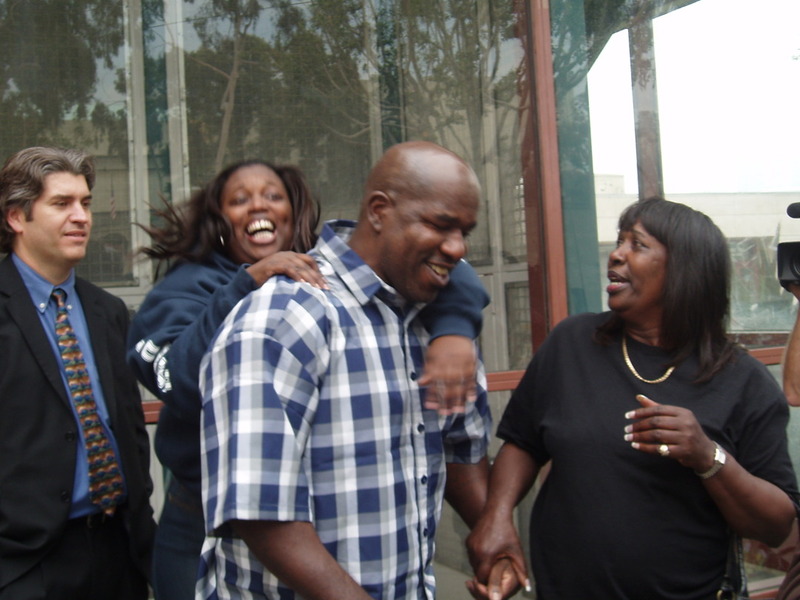 Atkins was exonerated in 2007, when a law student working for the California Innocence Project tracked Denise Powell down. Once she recanted her testimony, the prosecution’s case crumbled, because there was never any physical evidence linking Atkins to the crime. In 2000, California passed legislation offering compensation to people exonerated of their alleged crimes. Atkins’s case seems like one tailor-made for compensation: He was wrongfully convicted, with no known perpetrator to claim compensation from, no real evidence of police or prosecutorial misconduct, and no assets owned by the person most at fault, the so-called witness. Compensation from the state is all that Atkins can hope for to pay him back for the loss of all those years. But the Victim Compensation and Government Claims Board has denied Atkins twice. “To not compensate me is to say that you think I had something to do with this,” Atkins says. What his case reveals is a system that seems designed to punish former inmates a second time for crimes they did not commit. When Atkins left prison, he filed a claim of $713,100 for spending more than half of his life locked up. He moved in with his father and began looking for a job with the GED he’d earned in prison. Across the nation, exonerees are being released without the benefits that the parole system affords to convicted felons: no addiction counseling, job placement, housing placement, or “gate money” (about $200 in most places). 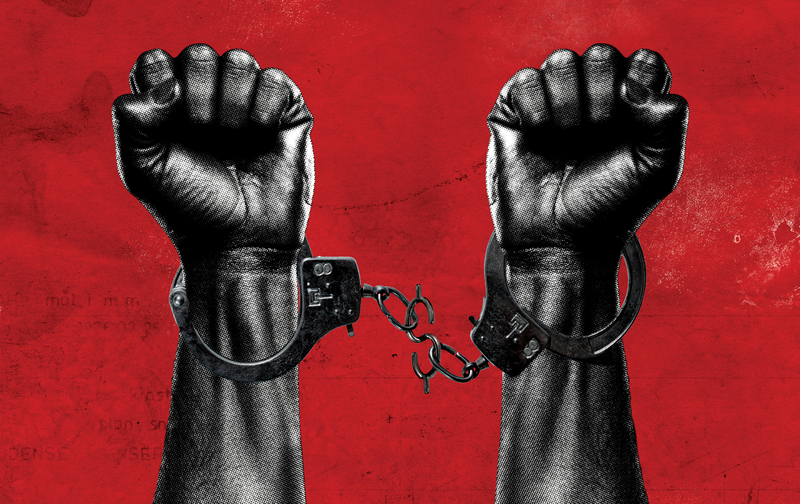 While convicted felons grapple with the stigma and a dearth of job experience while attempting to find employment, exonerees face the same challenges—with the added difficulty that they don’t qualify for the programs designed to served ex-felons. Atkins told me that one of the hardest parts about returning home was the psychological challenge of adjusting. In prison, he explained, all relationships are governed by a hierarchy of respect. But when he got out, he recalled attending his own welcome-home party and having trouble enjoying the company of his family and close friends: Everyone seemed to be standing too close and talking too loudly. Atkins and his mother (right) upon his release from prison. Shortly after leaving prison, Atkins was at a CVS with a friend when a man bumped into him. Atkins instinctively wanted to grab the man. His friend was surprised at this reaction, and Atkins began to worry that he scared people. “I think differently now,” he adds. Atkins went to therapy, which he says helped. And he refused to be idle: Immediately upon his release, he began working as a gang-intervention specialist in Venice, California, counseling at-risk youth and teaching them the importance of avoiding gangs. He also received a certificate from Cal State in gang intervention. Even working at this job, Atkins says, he was stopped and searched on the street while talking to kids. Eventually, the program lost its funding, and Atkins had to find a new job. To explain his time in prison to potential employers, he would show them the news articles about his exoneration. Most of the time, he said, it wasn’t really a problem: His last employer even apologized for the pain that Atkins had been through. Atkins became a bus driver in Bakersfield, but he was forced to quit that job after injuring his leg in a parking lot and spending some time on disability. Now he lives with his mother and sister in Kern County and spends much of his time helping other exonerees through the process. The day I saw him, he had been in court watching a friend face a hostile jury. Atkins also has a son, Tim Jr., now 8, whom he hopes to raise right. And he’s still waiting for his compensation. States vary widely in their compensation schemes for the wrongfully convicted. Currently, only 30 states—including Atkins’s home state of California—offer any kind of compensation at all. Some states, like Texas, have created a fairly comprehensive compensation statute, including medical care and tuition at a state university. Other states permit compensation to be paid only for DNA-based exonerations. California’s standard for obtaining compensation is the most onerous in the nation. States also often add hurdles for those seeking redress. In Tennessee, for example, a man was released after 30 years, proven innocent by the DNA evidence, and still awaits his official “exoneration” from the governor. Various other administrative delays are common: Most exonerees don’t receive the required compensation until several years after they’re free. California’s law allows exonerees to collect $136.98 from the state for each day spent in prison. (This was just raised in September 2015 from $100 per day.) These claims are determined by the Victim Compensation and Government Claims Board, which also hears matters concerning compensation claims by crime victims and claims against state workers. It’s a cumbersome process, and while new laws have recently streamlined it somewhat, all claims for exoneree compensation require the passage of legislation—indeed, from beginning to end, the process takes no less than year, and often much more than that. According to Wayne Strumpfer, the compensation board’s chief counsel, the board has approved 22 claims out of 81 since the year 2000. And 10 of those were in the last two years, after the law was changed to make the process slightly more streamlined. And these numbers don’t include the petitions that were rejected because they didn’t fulfill the requirements of the statutes. Yet, like everything else in the justice system, this law has its vagaries and exceptions. Take Atkins, who filed his first compensation claim before this bill was passed. He appeared before a hearing officer and presented his case, but the officer issued a recommendation to deny his claim. Based on the new law, Atkins appealed that decision. He was now armed with a finding of innocence and a new law on his side. But the board ruled that the law still didn’t apply and again decided in a 2-to-1 vote to reject his claim, even though the hearing officer this time recommended that Atkins be compensated. The board consists of three members. Two are state administrators; the third, Michael Ramos, is the current district attorney of San Bernardino County, which has sent a disproportionately large number of people to death row. Ramos had also embraced the cause of restoring California’s death penalty and making it more efficient in order to execute people more quickly. The next person on death row up for execution is Kevin Cooper, a man who has not only exhausted his appeals but who is considered possibly innocent by some judges on the Ninth Circuit. Ramos, meanwhile, has begun a campaign to succeed California Attorney General Kamala Harris if she is elected to the US Senate, and his push to restore the death penalty is a large part of his platform. “No one is innocent on death row in California,” Ramos has declared. When asked about the state’s newly proposed single-injection method, he replied that he “truly believes it’s a humane death” and that arguments to the contrary were simply a “tactic to delay.” In support of his position, he provided an unsourced quote by a death-row inmate saying that he wanted to die. For a compensation claim to be approved, two of the board’s three members must agree. Generally, they follow the recommendation of a hearing officer, who first reviews all of the evidence. (The state attorney general’s office also decides whether to support the petition, and opposed it in Atkins’s case.) I reached out to the board’s members to ask about his petition, but was told that they couldn’t comment because it was still on appeal. After Atkins’s attorneys appealed the decision, a court ordered the board to consider his compensation claim under the new statute, which requires that a judge’s finding of factual innocence be honored. In June 2015, the hearing officer recommended that Atkins receive compensation based on that finding—but the board, in a rare move, denied the claim in a 2–1 decision, with Ramos once more voting against it. This latest decision is now being appealed by Atkins’s attorneys. In the meantime, Atkins is trying to enjoy a normal life—or at least a life as normal as possible for a wrongly convicted African-American man in a world dominated by prejudice. The last time that Atkins was stopped by a cop—in Bakersfield, where he now lives—he pulled over and stuck his two big hands through the open window. The cop, irritated, asked him what he was doing. “I don’t want to get shot,” Atkins replied. (An investigation by The Guardian recently found that Kern County, where this stop happened, had the most incidents per capita of people killed by the police anywhere in the United States, so his fears were certainly legitimate.) The officer proceeded to check his ID and registration, and learned via his Livescan system that Atkins had served more than 20 years in prison for a murder he didn’t commit. Grudgingly, the officer let him go with a warning for rolling through a stop sign. T-shirt from the California Innocence Project, and he’s watching a football game on television. He still walks with a slight limp from his workplace injury. His voice is low and deep, hard to hear over the game’s announcer. Atkins says that he wore this same T-shirt to court last week; he was there to provide moral support for a friend on trial. The judge asked Atkins to turn the shirt inside out lest it send too political a message. Atkins adds that the judge looked at him with suspicion the minute he entered the courtroom, and a juror objected to his presence because she feared that Atkins would somehow learn her address and telephone number (even though the jury’s contact information isn’t distributed to anyone). In the end, Atkins’s plight points up the hardships endured by those who have been wrongfully imprisoned and then released. After the initial celebrations and news coverage and welcome-home speeches are over, these men and women are left with the daunting task of rebuilding their lives from scratch. They’ve had years, even decades, stolen from them, and yet they’re simply expected to reintegrate into society and live like everyone else, often with very little assistance or compensation from the state that unjustly locked them up in the first place. “They just need to follow the law,” Atkins says concerning his own appeal, looking glumly into the night as we watch some kids playing with their skateboards in the street. He’s smoking a cigarette; the smell of a neighbor’s barbecue wafts overhead. “It just doesn’t stop,” he adds.